On Friday, 23rd August 1850, a young man wrote in his diary, “My world was to be keeping cattle… then bullock-driving and work in the vineyard.” The writer was the twenty-year-old Thomas Hardy, who in the summer of that same year had left his home county of Devon in England to live on the other side of the world in the fledgling colony of South Australia. He found work on a farm that also had a vineyard, where he learned the basics of vine growing and wine-making, but after a couple of years he left for the goldfields of Victoria. For those were the days of the Australian Gold Rush which began in 1851 after a prospector claimed to have discovered gold in New South Wales. Thomas worked for a meat company that fed the ravenous miners who spent most of their time slogging away in the gold fields in search of a fortune. 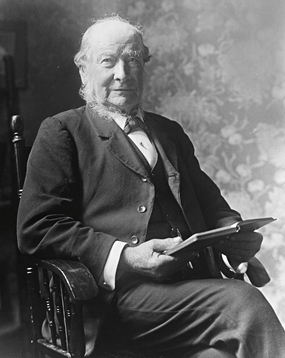 The man himself: Thomas Hardy in his later years. The big change for Thomas came in 1853. He had saved enough money to get married and buy his first property which he called “Bankside” which has since become known as the birthplace of Hardy’s wines. It was originally a mere forty-six acres, sitting on the banks of the River Torrens which flows from the Adelaide Hills down to Gulf St. Vincent. In 1854 Thomas planted his first vineyards with Shiraz and Grenache vines. He made his first wine in 1857 and a couple of years later exported two hogsheads of Australian wine to England. It was one of the very first wine exports from South Australia. And by the way, a “hogshead” is an old English name for a barrel containing about sixty-three gallons. The word fell into disuse years ago, along with other quaint wine measurements like the “puncheon” and the “rundlet”. The English beer industry also used hogsheads, but they also had other delightful words for measuring beer, notably “kilderkins” and “firkins”. Thomas Hardy had a driving ambition and bought up vineyards whenever he could. He eventually founded The Hardy Wine Company in Adelaide and the business soon became South Australia’s largest winemaker. 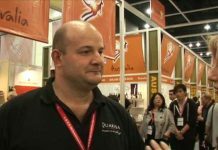 Today, Thomas Hardy is considered Father of the South Australian Wine Industry and the company is one of the most powerful Australian wine brands. This year the company is celebrating its 160th Anniversary. Hardys “Stamp of Australia” series first appeared fifteen years ago and has become one of their most recognised products. The series consists of about a dozen varietals, all of which are entry-level wines. This purple-red wine has a jammy aroma of ripe black cherries, blackcurrants and a touch of fresh mint. You might also detect the smell of plums and sweetish oaky vanilla. One thing that always impresses me is that the winemakers at Hardys invariably manage to bring out excellent aromas in their wines, even the basic entry-level jobs. The wine is medium-bodied and very fruit-forward; loads of blackcurrant and cherry on the palate and only the slightest hint of acidity. Although there’s hardly any tannin, the wine is medium-dry but not in the dry-as-a-bone class. It has a pleasantly smooth mouth-feel along with a very fruity, rounded finish (that’s the time the taste persists in your mouth after you’ve had a swig. The wine comes with 13.5% alcohol content, which is almost the top of the tree for table wines. They probably sell this wine by the truck-load and it would be perfect if you want an easy-drinker to knock back at the Barbie. It would probably go down well with those people who don’t normally consider themselves wine drinkers. In case you’re wondering, the “VR” stands for “Varietal Range” and the name “Moscato” is just another name for “Muscat” a grape that originated somewhere in the Middle East. The colour of Muscat grapes ranges from white to near black, and their wines invariably have a pronounced sweet floral aroma. 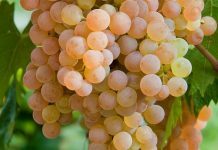 The grape is perhaps best known in the form of Moscato d’Asti, a pleasant and very popular wine from Italy’s Northwest region of Piedmont. So here we have an Australian Muscat: a pale straw color with flecks of green. There’s a fresh and attractive aroma of green apples and herbs. I could also pick up hints of citrus and a kind of flinty grassiness. Although the wine is very sweet, it’s not cloying because there’s a very slight crispy spritziness to the mouth-feel and this helps to balance out the sweetness. The taste rather reminded me of the apple pies my mother used to make during the middle years of the last century, and the wine really has a kind of old-fashioned summer fruit flavour. 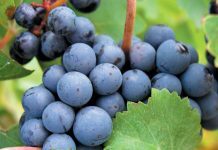 In contrast to the Cabernet-Merlot, this wine comes at only 6% alcohol and barely qualifies for the term “wine” at all, because wine is usually defined as having at least 8% alcohol. Until a couple of years ago, if any Australian winery produced something with an alcoholic content below this value, they were not allowed to call it wine. But in 2011 the regulations were changed by the Food Standards Australia and New Zealand, with the result that low alcohol sweet wines are now appearing. This type of light wine has been experiencing enormous growth in Australia for the past three years as a very refreshing alternative to traditional white wines. As you might expect, it’s made in an easy-to-please style, and it would probably work well with apple desserts, fresh berries or cakes – or just on its own after a meal. It would certainly make a good partner for many Asian dishes but to my mind, the wine tastes best when it’s really cold, so you can serve it straight from the fridge. You might like to try it with a mild cheese like Brie or Camembert. Forget that old nonsense about always drinking red wine with cheese. I have no idea where this daft notion came from, but it simply isn’t true. For some cheeses, notably Beaufort, Brie, Gruyère, Emmenthal or Feta, white wine invariably makes a much better partner than red. Go on – dare to be different!